Place almonds, oats, coconut, chia seed and salt into TM bowl and mix 3 sec / speed 8. Add golden syrup, vanilla and water and mix 6 sec / speed 8. Roll into balls and coat in coconut and place in fridge. If you are wanting to make it nut free - use half pepitas and half sunflower seeds instead of the almonds. I just made these, so easy and tasty. These look amazing! What could i substitute the almonds with as i have a nut allergy child? Yum, yum, yum!! 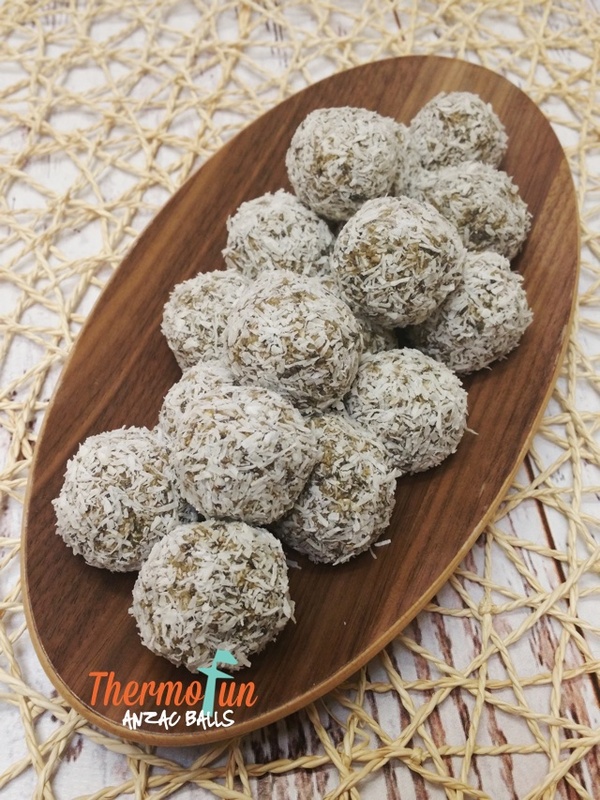 I just made these and instead of the 100g almonds and 20g chia seeds, I just chucked in a mix of 120g of almonds, chia seeds, linseeds, seasame seeds, poppy seeds, and sunflower seeds! Deliciousness! Leonie these are absolutely delicious!!!! My kids cant stop eating them, which is good because otherwise id eat them all lol. I don’t own a thermomix, so was wondering if there was another method? Fantastic recipe, I have made it so many times and never tire of it. Great to take on camping trips.. Thank you for sharing. Yum! These are so delicious. Gotta love the fact that something so yum is also healthy. Can I leave out chia seeds , or substitute something else? Yum!! I could have sat here just eating out of the bowl. I cheated though and have put mine in bars as I’m too lazy to roll them lol. Do these freeze? Hi Annette, yes they freeze great and also it does make it a little hard not to eat it out of the bowl! Also bars that’s a cool idea. Yes you can use vanilla essence Katrina 😀 Enjoy! Can I use honey instead of syrup? Love these, so easy I made them very small so made a whole lot. Added cocoa to some of the mixture as some people are hard to convince that healthy is tasty. Both tasted really good. Took them to Bowls early morning to have with a cuppa.